As we wind down spring training 2018, teams are already looking forward to 2019—and so should you. On Tuesday the Milwaukee Brewers held a groundbreaking for upgrades to Maryvale Baseball Park in 2019—changes than you should plan on seeing next spring. We’re writing this from the Maryvale Baseball Park press box, as the Brewers prepare to take on the Oakland Athletics in the last week of spring training. Truth is, there’s still a lot of great baseball still on the docket, as teams won’t wrap things up until March 27. The Brewers, however, wrap up the Maryvale Baseball Park home schedule on March 22, playing three Cactus League games on the road before heading to Houston and Minute Maid Park for two exhibition games. March 22 is an early close to home spring training games, but there’s a purpose: work will begin on the offseason renovations to Maryvale Baseball Park. Immediately, as in Friday, March 23. The groundbreaking was held yesterday, and plans are being churned out to ensure the renovated facility will open in 10 months. 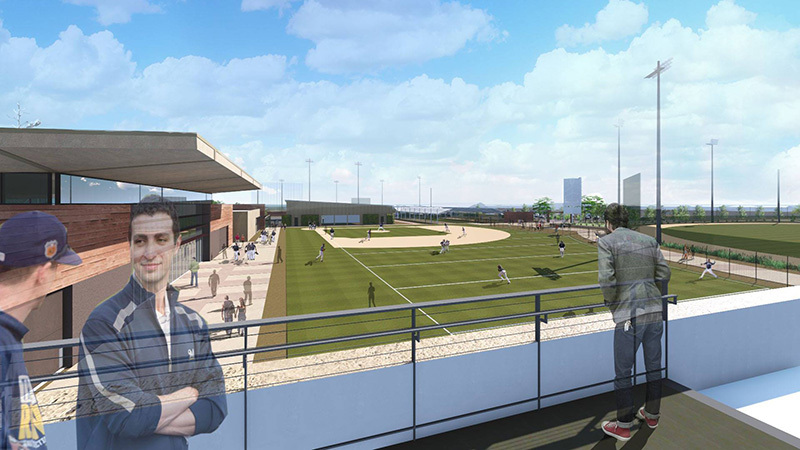 The goal of the Maryvale renovations is to reorient the ballpark from an inward-looking facility to one better integrated with the Maryvale neighborhood. If you’ve been to Maryvale Baseball Park in its current configuration, you know there’s plenty to like: lots of shade, a large berm, and very good concessions. But as far as projecting a friendly image, Maryvale Baseball Park is more a closed environment than an open and inviting ballpark. The new entry plaza will feature the primary ticket office and gates to the ballpark. The east side of the plaza area will include the lobby entrance to the new clubhouse building. In addition, there will be the entry to the new retail store from outside of the home plate gate, allowing fans access to the store during non-game times. The existing Major League clubhouse building will stay, but it will be connected to a new standalone, two-story building, running all the way to the new home plate gate. This building will house new clubhouses, training spaces and support functions for the Major and Minor League teams, a new flagship retail sales store and a new primary ticket office at the new home plate gate. The north side of this building will be home to new concession stands and restrooms as the first base concourse will be widened to accommodate better pedestrian traffic. A second floor will be constructed to house new offices for Baseball Operations and will feature a walkout patio with views of training facilities to the south. (Yes, that’s David Stearns in the rendering of the new patio, above.) Most of this will be built on the current Lot C parking area. Oh, there’s one more big change: a new videoboard. Progress comes to Maryvale Baseball Park.